Our Prestige line of enclosed trailers is designed with the highest precision and greatest attention to fit and finish. With features like a front and rear ramp door, as well as two full-length quickslides, you can be sure every detail has been crafted to meet the unique needs of recreation, commercial or combination hauling. Take a look at some additional features below, and be sure to request a quote from your dealer when you find the model you’re looking for. 2 full deck length Quickslide tie down channels welded to the framing provide unlimited tie down flexibility. Shown with options. Hitch height of ball will increase 4” if equipped with surge disc brakes. Measure your vehicles for actual needed model size. Recommended tongue weight for enclosed trailers is 7-10% of GVWR. Please note: It is the responsibility of the purchaser to adhere to the brake laws regarding trailers. For full information on trailering laws, contact the appropriate Motor Vehicle Department. Brake options will change the overall length of trailer. 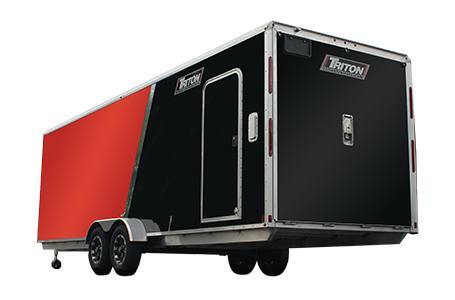 Contact your local Triton dealer for order lead times. All trailers ordered without brakes will have a GVWR of 2995#. Specifications, and accessories can change without notice.